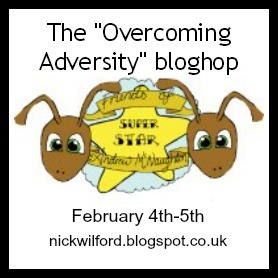 Nick Wilford is hosting his very first blogfest, in honor of his stepson, Andrew. He is planning on compiling all of the entries into a special anthology and to use the proceeds for a college fund for Andrew. Andrew has cerebral palsy. Nick's goal is to get him into a college where he can continue to learn and pursue what he is interested in! It's a great cause! * Keep it family friendly! * "Write about overcoming adversity for something you believe in! It can either be a flash fiction piece, or an episode from your real life. Poetry is fine too." One of my closest friends has Ehler-Danlos Syndrome, which is an inherited connective tissue disorder. Because of the disorder, her physical appearance is different. Some people look at her strange, and yet they don't know her. She is full of life and one of the sweetest people you could meet! I decided I wanted to share a little flash fiction about someone with Ehler-Danlos in honor of her. At twenty years old, Samantha sat upon the stone fence at the university, swinging her legs back and forth. Her life expectancy was only forty years. While other kids were just beginning their lives, hers was half over. She sighed, tucking what little hair she could behind her ear. Samantha stared at the picture of her father; she looked so much like him. But it was genetic and he’d died of the same thing when she was only three years old. A Frisbee buzzed by a second later. Samantha grabbed tight to the wall. “Yeah, I’m fine. You just scared the crap out of me,” Samantha mumbled. Samantha laughed at his stuttering and it only seemed to make Jason blush more. “I didn’t know anyone was watching me,” she teased. “Yeah, um… would it be too forward of me to ask you to have coffee with me?” he asked. “But, what if you don’t like me?” she murmured. Two years later, Samantha walked down the aisle and married the love of her life. Jason never judged her or asked stupid questions. He loved her for who she was. It didn’t matter Samantha couldn’t have a baby. They adopted a little girl and named her Julia. She’d known since she was little. Samantha was always different. Bruises would appear on her skin if she barely bumped the table or if she tripped. Her hair was thin and Samantha could barely pull it up. Her green eyes were sunken in. The color of her skin was pale and almost translucent. Numerous hospitals visits with IVs and tubes from collapsed lungs left scars on her skin. She’d always been sick and her mother had explained it, but Samantha never wanted it to control her life. Samantha didn’t get a long life to some, but to her forty-two short years were enough. One can waste their life wanting or live their life grateful for each day and each moment. Samantha did the later. This a great cause - be sure to check out Nick's blog and hop around to the other blogs participating! Great work, Krista and a brilliant message! I want to give the guy a hug. It can't be easy letting yourself love someone when you know they won't be around for as long as you would like. Sure it true for all of us. But when you have a good idea when the person is going to die, before you've started your life together, it can't be easy. awww! do guys like that really exist? the wonderful thing i believe is that you find who (or what) you need when you stop worrying about what you want... beautiful story, jelly bean! You had me near tears with this. Great story! Excellent piece. It's what you do with your life that counts, not how long that life is. Don't want to discuss Andrew's life expectancy here, but we all want to make sure he lives his life to the fullest - that's what this campaign is all about! Thanks so much for taking part! Yes, we should be grateful for what we've been given. Then life becomes less difficult and joy can come pouring in. This is one of my favorites. Wow. What a great entry. Thanks for sharing! This is a great story with a wonderful message. This is so touching and remarkable. What an amazing story! I love that she "did the later." An amazing story! Thank you for sharing. A good online friend of mine has this syndrome and I've heard all the horrors of it. She's trying to go back to school now, but it's rough for her. She has such an amazing spirit and creativity, and I admire her greatly. Nice story Krista - sounds like if your friend was the inspiration for this then she is definitely an inspiring sort of person!